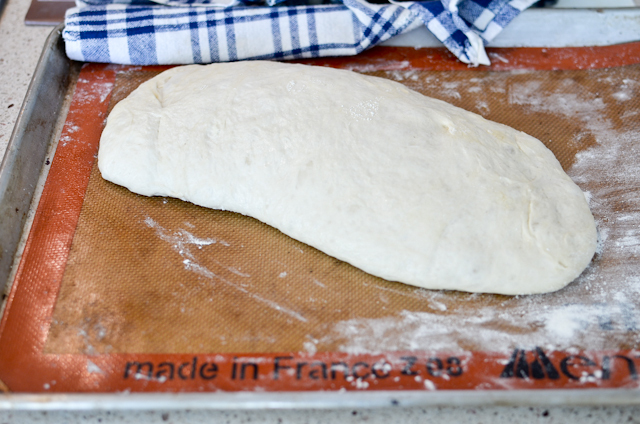 I have been making Ciabatta from Peter Reinhart's Artisan Bread Every Day several times now. The recipe makes 2 large loaves of ciabatta but I've been halving it and making 1 loaf at a time. It is super good and pretty easy. 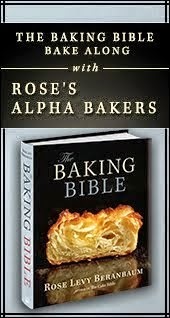 I think it's a much simpler method than the Ciabatta in his Bread Baker's Appretince book. 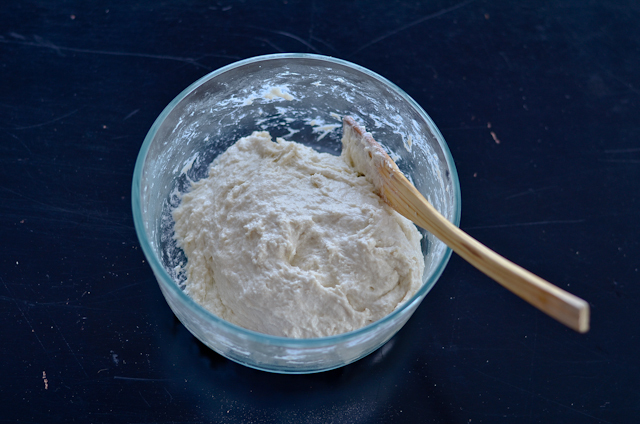 This version does not require poolish and everything can be done in one bowl, no mixer required. I don't own Peter's BBA book but I am curious how the 2 ciabatta compare, tastewise. So one of these days I will try the BBA recipe and blog about it. 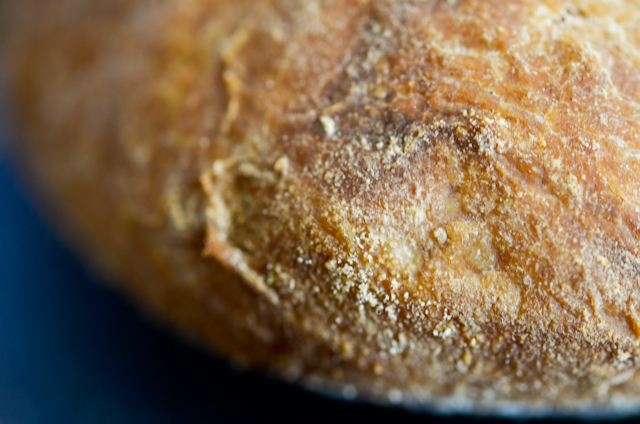 But for now, let me show you how this one from Artisan Bread Every Day is. 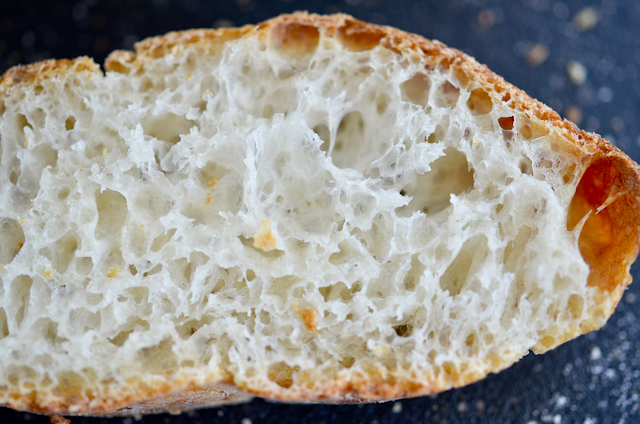 Half recipe of Ciabatta used 2 1/4 cups (283 grams) of unbleached bread flour, 1 1/4 tsp kosher salt, 1/2 tsp instant yeast, 1 cup of chilled water, and 1/2 Tbsp of olive oil. 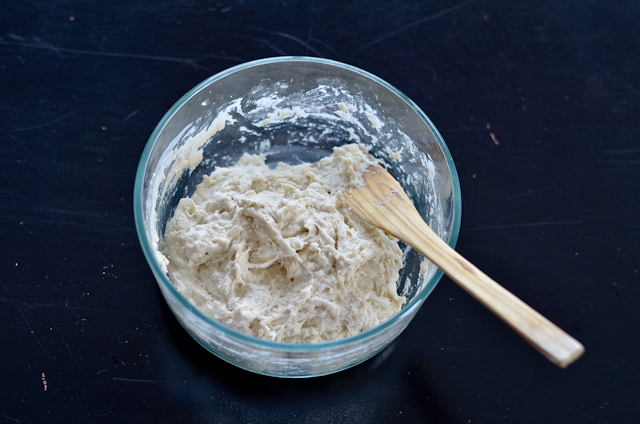 Mix flour, yeast, and salt in a bowl. I used a pyrex container. Then prepare your cold water. The water should be cool, so I put 3-4 ice cubes in the water. Let it sit for a few minutes until the ice starts melting and the water feel cool to the touch. 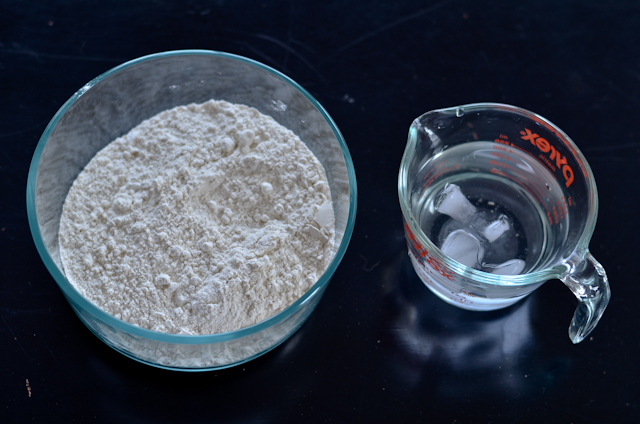 Dump the cup of water into the flour mixture. Mix with a wooden spoon for a minute or so until they are combined. Then let it rest for 5 minutes. 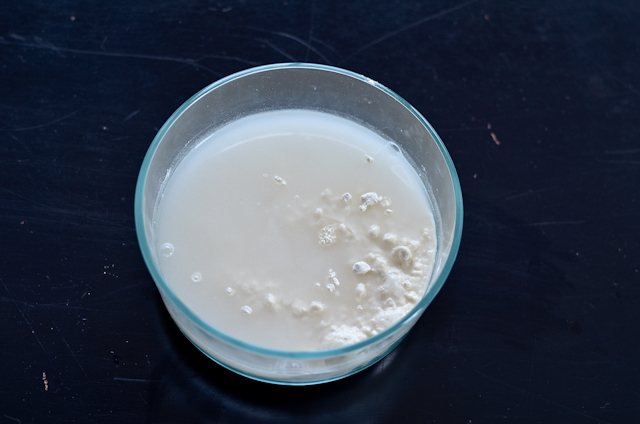 After 5 minutes, mix it again with the wooden spoon more vigorously for another minute. At this point Peter said to dump the mixture onto a greased countertop for the next part. I like to do this all in the container because the container comes with a cover so I can just put the cover on between the resting period. Also, I used the same container for storage. So I just washed the container and dump the dough back in. 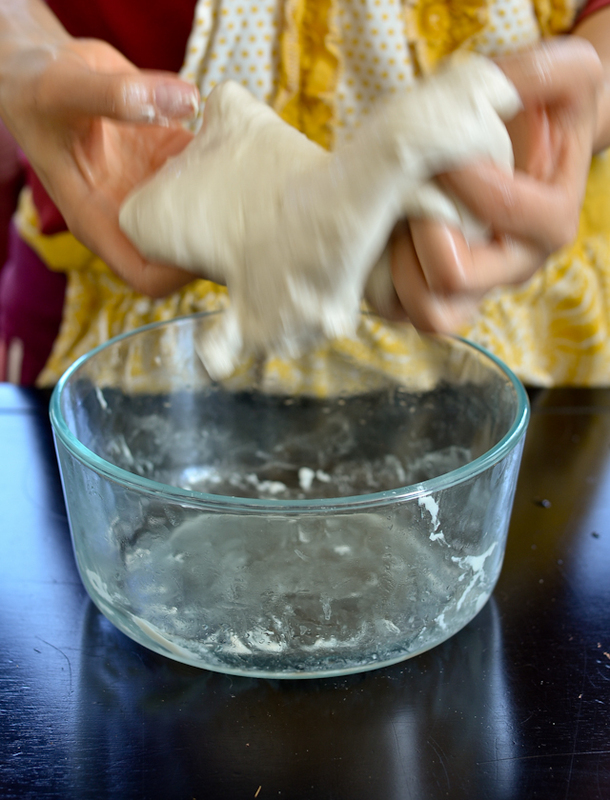 However, the dough looks much smoother now than the previous picture, doesn't it? It is pretty unbelievable what the 10 minute resting does (and what a clean bowl does as well!). 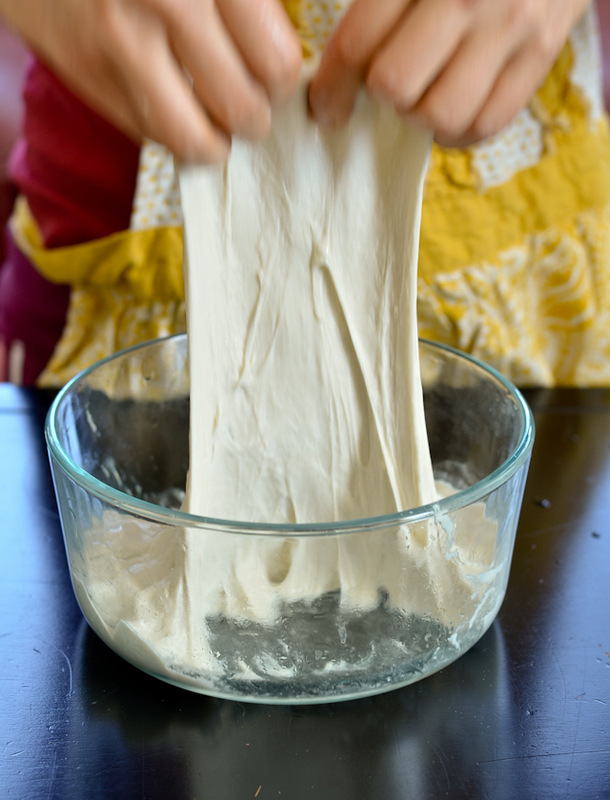 Next part is the stretching of the dough. With wet hands, take one side and pull it up. Take the other side and pull it up again. 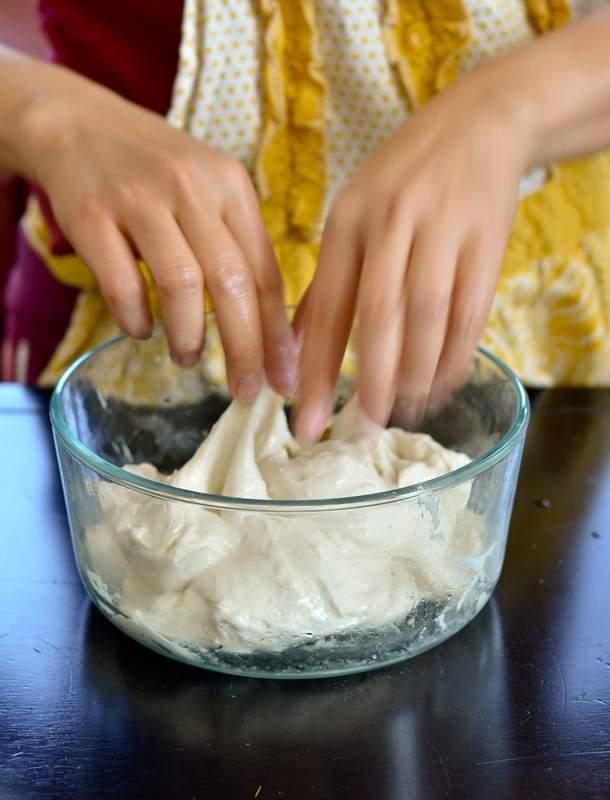 Lift the whole dough to turn it over. Place it back in the container and cover. 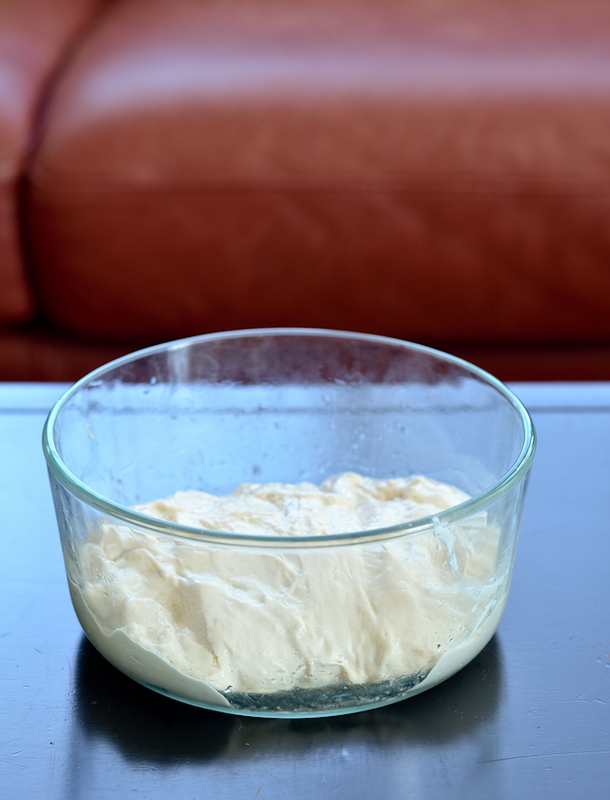 Then cover the container and let the dough rest for 10 minutes. Repeat the whole process 3 more times, each with 10 minutes repetition. 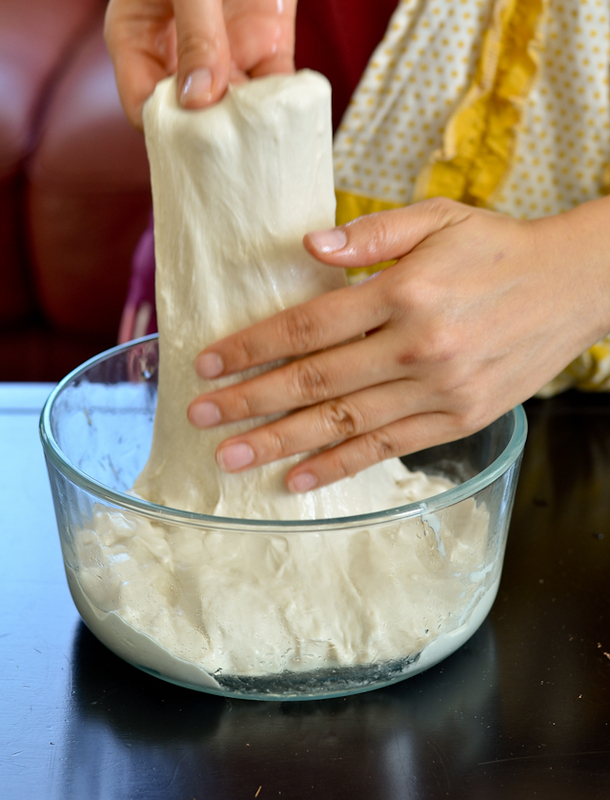 he next day, take out the dough 3 hours before baking. 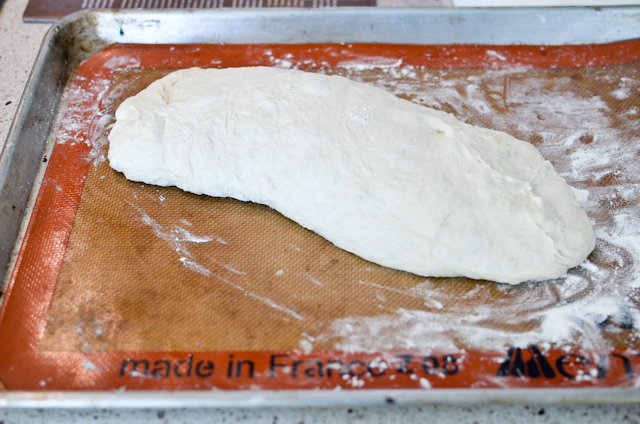 Let it rest in the container for an hour before proceeding to shaping. 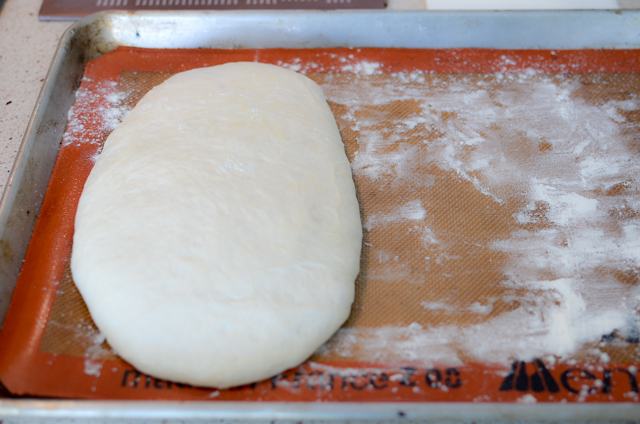 After an hour resting, it is time to shape the dough! 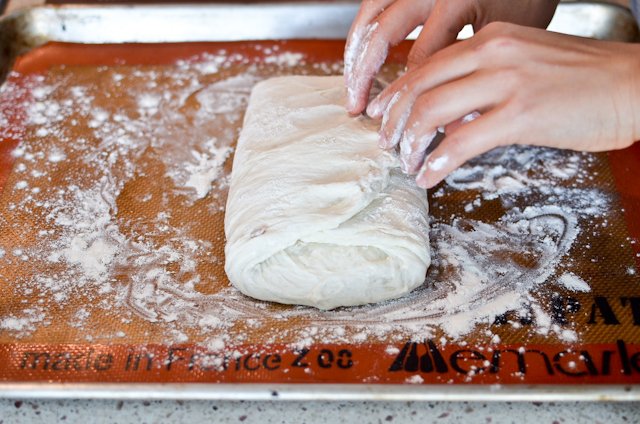 Prepare a baking sheet with floured silpat or parchment paper. 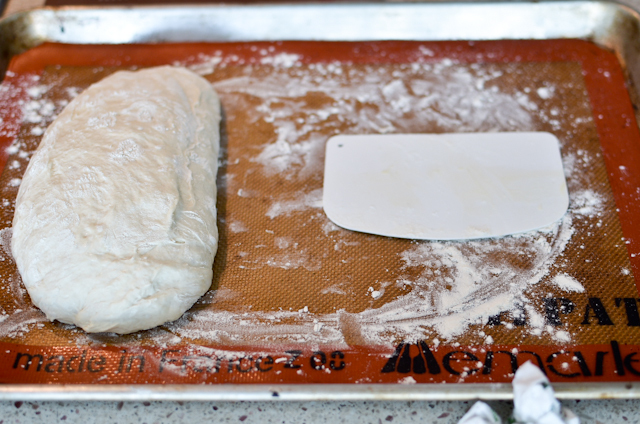 Move the dough carefully onto the baking sheet. With wet hands, shape it onto a rectangle. 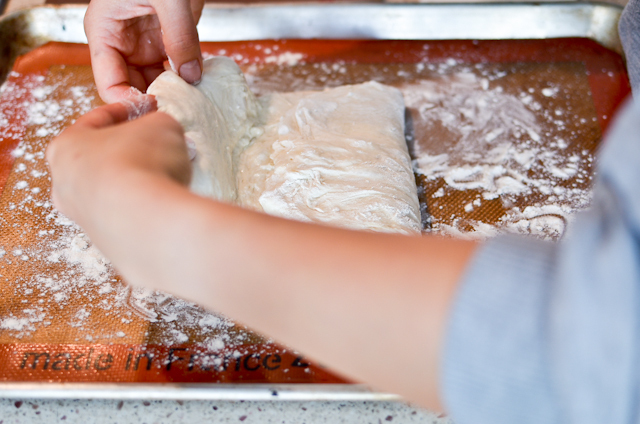 Take the edge of the dough and fold it over. 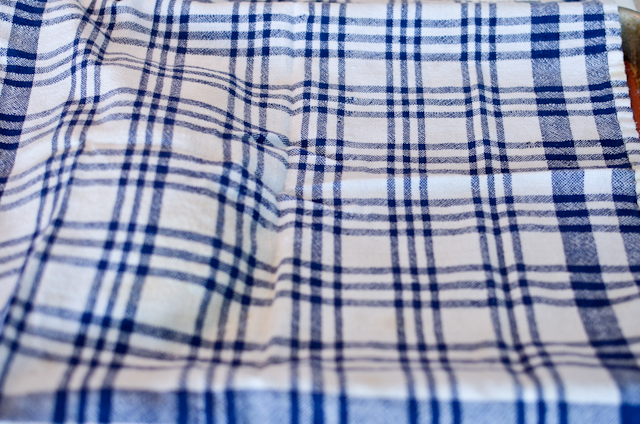 ...and slowly flip it over so the seam is on the bottom. 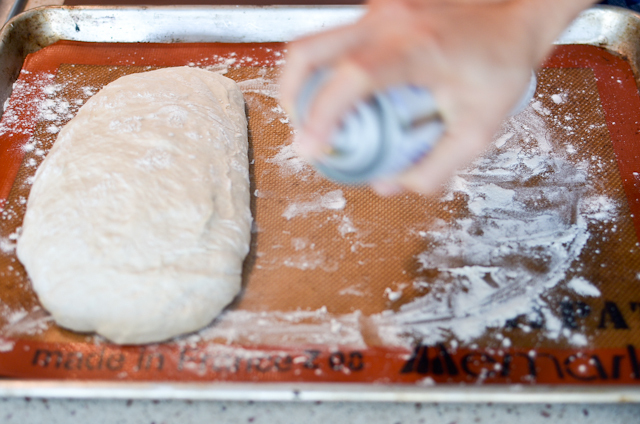 Spray the top of the dough with baking spray. Cover with a lint-less towel. Let it rise for an hour. 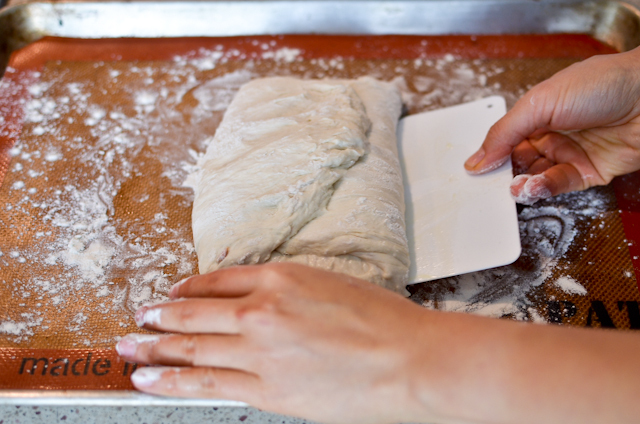 Flip the dough over so the seam is on the top. Let rest for another hour. 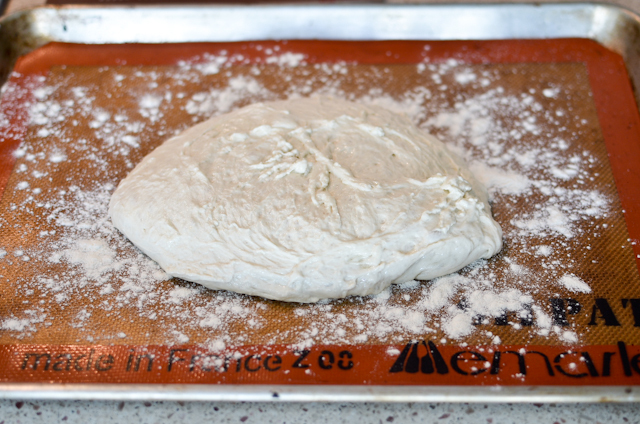 15 minutes after the 2nd rise, preheat the oven to 550 degrees Fahrenheit and prepare it for hearth baking. 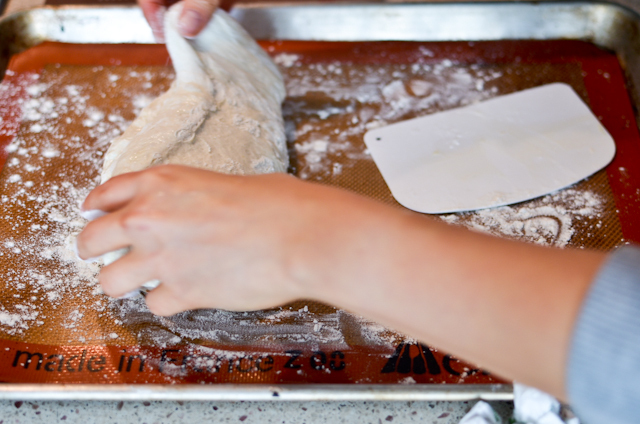 This means placing a baking stone on the middle rack and an empty pan on the lowest rack of the oven. 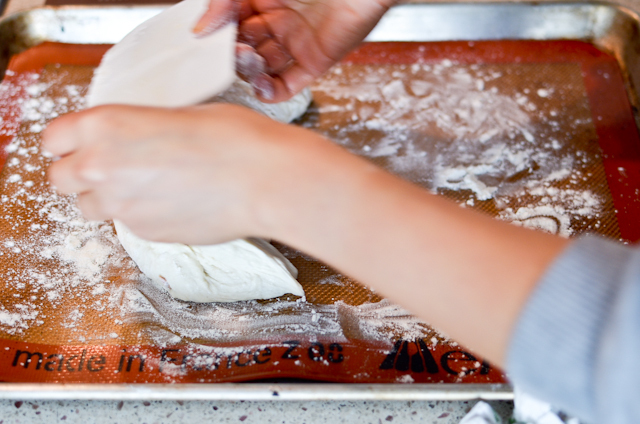 Then slide the baking pan onto the baking stone, cover the window of your oven, and pour a cup of water onto the preheated empty pan. Be careful when doing this. I usually wear oven mittens when I pour the water because I don't want to get steam burn. Those are nasty and very painful. You can also check out a one minute video tutorial posted by Peter Reinhart on how to do hearth baking on YouTube. 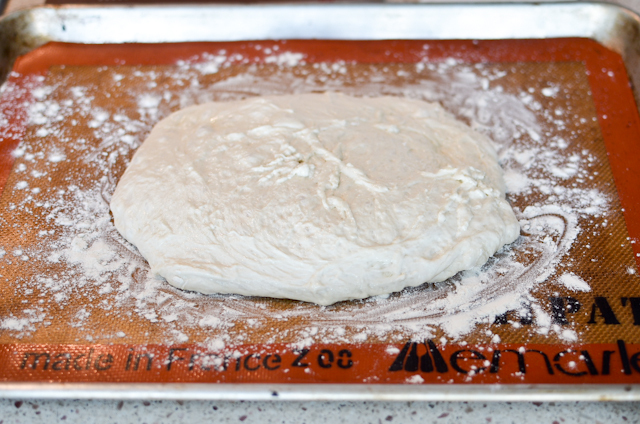 After pouring the water onto the preheated pan, lower the temperature to 450'F and bake the bread for 12-15 minutes. Rotate the pan and bake for 15-20 minutes more or until it's golden brown like the picture below or the internal temperature is about 190'F. Up close and personal on the texture. Bread interior! I love seeing those holes :). This is best eaten on the same day. When I have leftovers, I often have it toasted with some jam. Yum! Great photos, as always; I can just feel the texture! 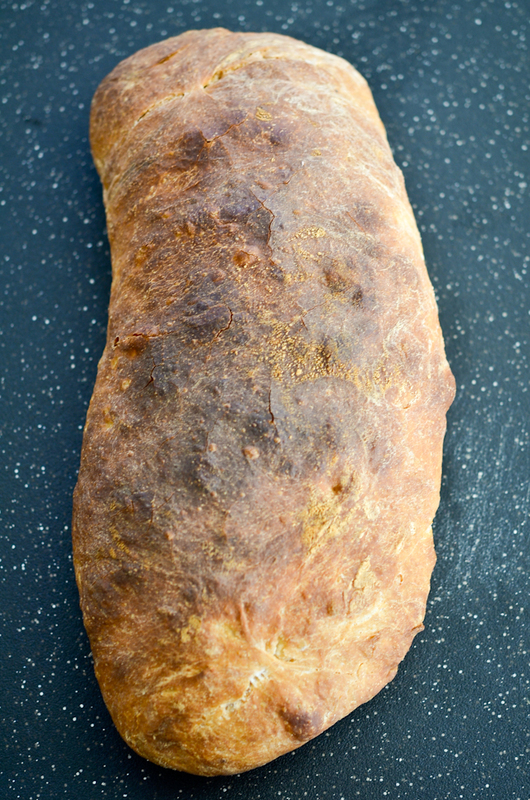 I have been making Reinhart's Ciabatta Bread from the Bread Baker's Apprentice for years and love it. 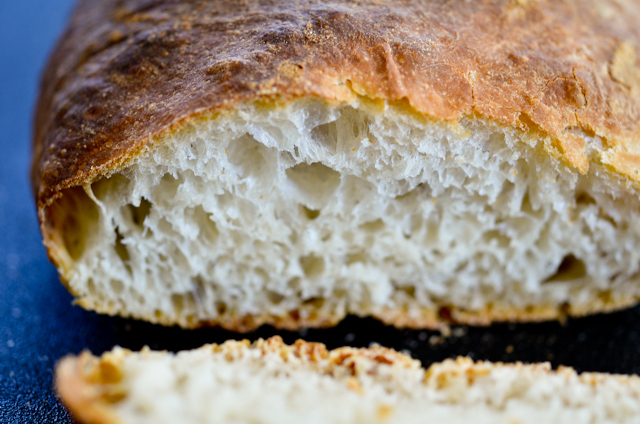 I have been a bread baker for many years and yes the poolish is a little more work but I think flavor wise it makes a great deal of difference. 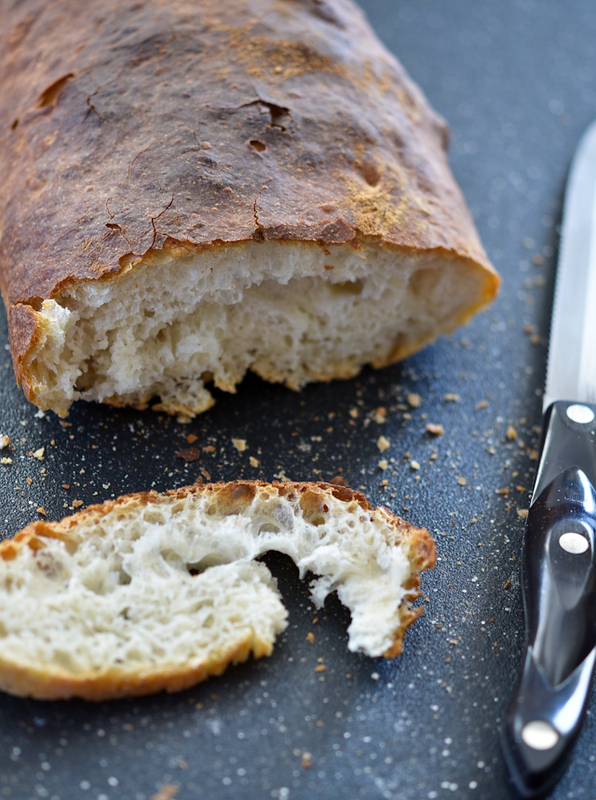 (I always use King Arthur Bread Flour) I have many friends that say this is their favorite bread! 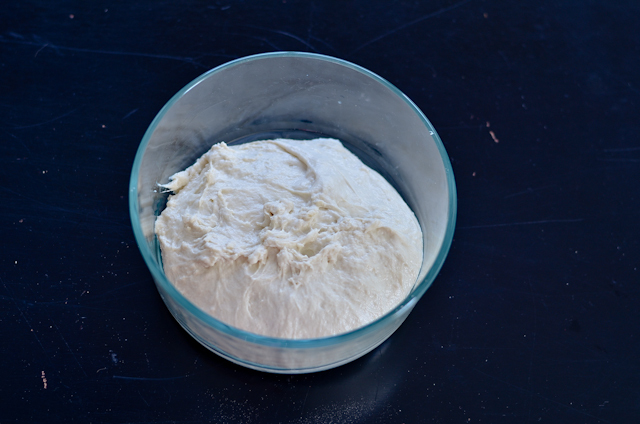 You should also try his Foccacia with a poolish as well. This past summer I grew fresh lemon basil and made pesto and froze it before the weather turned cold. 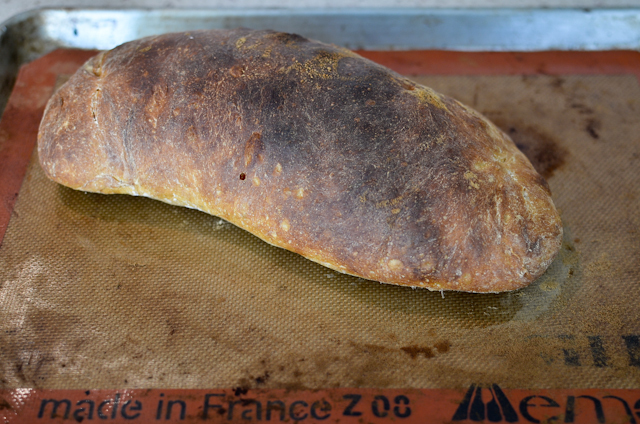 Try this: Spread walnut pesto on the Ciabatta that you have split in half and bake until the bread gets even crustier. Then top with sliced fresh mozzarella and put back in oven again to melt. YUM!!!!!! We also do this on the grill for a smokey flavor as well! Thanks Anonymous, I will try the poolish version next time. There is foccacia in the Artisan Bread Every Day that I've been wanting to try. Your fresh lemon basil and walnut pesto sounds really good! 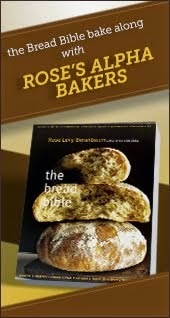 Hanaa, the ciabatta from this book is really that easy. Try it - and you have my pictures as a reference! Hi Hanaa, it is 283 grams. I've also updated the post to reflect this and added baking time. I hope you'll make this and let me know how it turns out! Guess what? I made it and it turned out awesome!!!! :o) I can't tell you how happy I am. 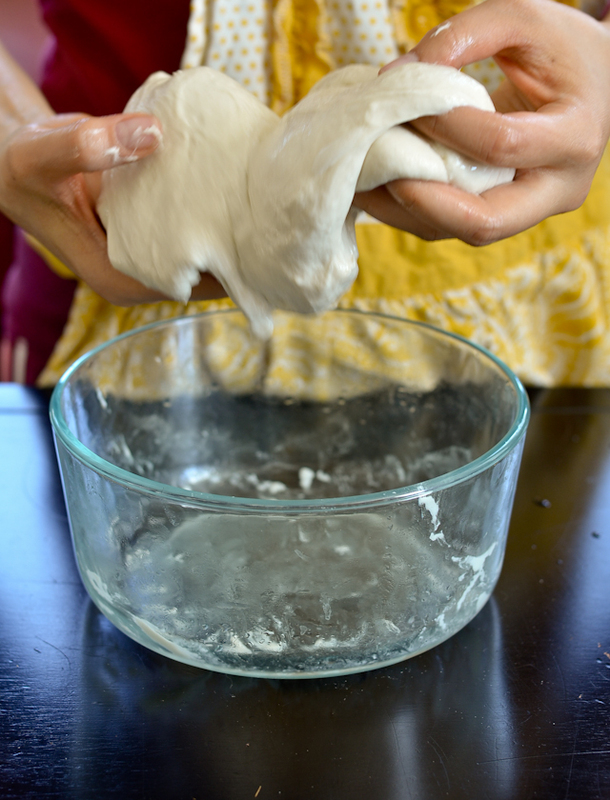 I never had much luck with super wet doughs before but this recipe is a keeper! I'll either do a blog post and link to your post, or email you some pictures. The bread tasted great! It had nice holes in it. I was super excited (and now days later, I still am, haha). Thanks so much for the encouragement. I'm glad I gave it another shot. Btw, as I making this recipe, I noticed that you forgot to mention when to add in the oil. So I just took a guess and added it with the ice water. Hanaa, I'm so happy that you tried this and it is working out for you! WOHOOO!!! Please send me the pics or do a post, I'd love to see it. And good call on the olive oil. I added it after I mix it the dough with ice water.